Published on October 9, 2014 by David Fegan Follow me on Twitter here. During an inspection of a hostel in the arid, mountainous tourist thoroughfare town of Tupizia, Bolivia, I thought I heard fireworks in the distance. As I was preparing to leave the hostel to continue my search a swarm of miners clad in royal blue jumpsuits with reflectors nosily marched past in the streets. They were divided into groups which were color coordinated by their helmets. They held banners and were supported by a passionate voice coming through two loudspeakers attached to the top of a beat up white sedan in the middle of the march. I realized that the fireworks were actually firecrackers when I stepped outside the hostel to take a look and the dull force of one of the explosions thudded through my chest. The signs indicated that this was the mixed miners union, presenting a discussion and ready for a fight. We again caught sight of the march minutes later on different street as the town was momentarily brought to a stop in the mid-morning sun. Tupizia is one of the starting points to the famous Salar de Uyuni, and both locals and tourists were drawn out into the streets to watch. 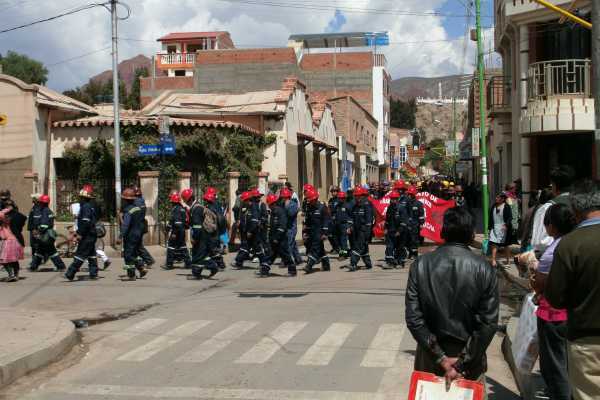 Later in the afternoon the miners could be seen around town with helmets in hands, looking tired but united in clusters. I caught up with a miner called Macario in the main plaza and asked him the name of their organisation, why they were marching, and anything else he wanted to say. Marcario said the doctors do not give good services to some people, the miners have had problems and a lady has died because of this negligence. 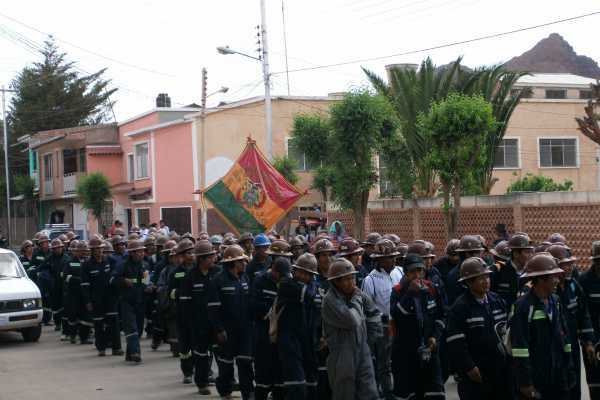 All of the miners from the other mines around Tupiza had concentrated in town to support this demonstration against the hospital, hence the different colored helmets. 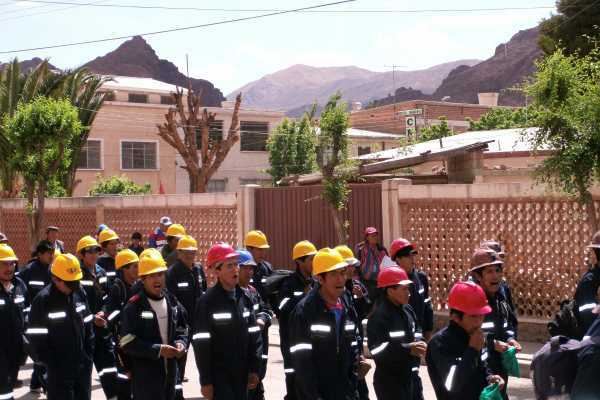 The march also aims to have a positive effect on other workers in the public service, who share the same health insurance as the miners, which are part paid by the government and part paid by the individual, as they are all sent to the problematic hospital. Later that day the Sindicato Minero Mixto de San Silvestre marched again, and this time some were on horseback. The next morning some of the French backpackers staying in our hotel informed us that their friends were still waiting for the bus that was meant to take them to the Bolivian administrative capital of La Paz the night before, as the miners had blocked the roads.